17 3/8 x 20", 185hp @ 150rpm engine by Sutton Brothers, Buffalo, NY (1887). 6 x 12' @ 120# steam firebox boiler by Portland Boiler works, Sandusky, OH (1887). 1888, Feb 18 Enrolled Sandusky, OH. 1899 Owned Sandusky Tug Co.
1913 Owned Canadian C130387, 72 x 16.5 x 7.5; 58 gross / 40 net tons. 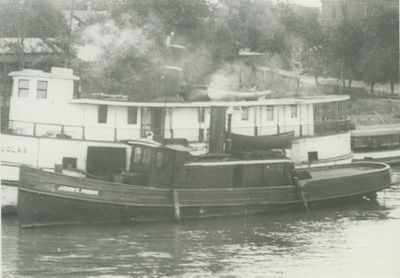 1930 Owned John Frasier, Amherstburg, ONT.